St. Damasus I, was born in 305, in Portugal, which was then part of the Western Roman Empire. Damasus seen the rise of Emperor Constantine I, and the reunion and re-division of the Western and Eastern Roman Empires. The Reunion is associated with the legitimization of Christianity, and was later adopted as the official religion of the Roman State in 380. He was raised in the service of the Basilica of St. Lawrence in Rome. And following the death of Pope Liberius, he was elected to the Papacy from 366-384. He faced accusations of murder and adultery, despite having not been married, in his early years as Pope. These claims seemed to have come into existence by the schismatic conflict with the supporters of Arianism. His personal problems were overcome with his religious accomplishments, which included restoring St. Lawrence, outside the Walls, encouraging his personal secretary St. Jerome in his Vulgate translation of the Bible, and presiding over the Council of Rome in 382, which may have set down the canon Scripture. He also did much to encourage the veneration of the Christian martyrs. He was active in defending the Catholic Church against the threat of schisms. In two Roman Synods 368 and 369, he condemned Apollinarianism and Macedonianism, and sent legates to the First Council of Constantinople that was convoked in 381. Pope Damasus appointed St. Jerome as his confidential secretary. Writing in 409, Jerome remarked, “A great many years ago when I was helping Damasus, Bishop of Rome with his ecclesiastical correspondence, and writing his answers to the questions referred to him by the councils of the east and west…” Jerome spent three years in Rome in close relations with Pope Damasus and the leading Christians. He was invited there originally to a synod of 382, to end the schism of Antioch, and was so indispensable to the Pope, that he took a permanent place in his councils. In order to put an end to the marked divergences in the western texts of that period, Damasus encouraged the highly repected scholar to revise the available Old Latin versions of the Bible into a more accurate Latin on the basis of the Greek New Testament, resulting in the Vulgate. St. Damasus died in the reign of the Emperor Theodosius, at the age of 79. He held the Chair of St. Peter for eighteen years, and two months. 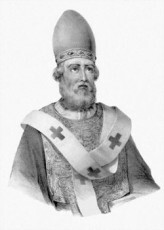 St. Damasus was the Pope from 305-384, and was noted for his defence of the Catholic Church against the threat of schisms. He held several Synods to tackle these issues, and also was noted for having as his personal secretary, St. Jerome. He was in the Papacy for eighteen years.